In December 1996, a wealthy yet little-known Pompey supporter by the name of Iain McInnes dug deep into his own pockets to fund the £75,000 signing of obscure Swedish striker Mathias Svensson. Less than 20 years on, that lifelong Blues fan has become a household name in these parts – living his dream as chairman of the biggest community-owned football club in England. Svensson, meanwhile, is enjoying a well-earned retirement, following a successful career which saw him fall in love with the Fratton faithful before later going on to play in the Premier League and for his country at senior international level. Perhaps most remarkable of all in this extraordinary tale, though, is 40-year-old Svensson only this week learned of McInnes’ involvement in his move across the North Sea. It was enough to make the man who scored 12 times in 39 Pompey appearances pledge an emotional return to the south coast. Speaking to the Sports Mail, Svensson said: ‘This is a touching moment for me. I am almost in tears here because I have just learned that today’s chairman paid my fee to come to Portsmouth. It makes me want to come to Portsmouth in the next month or two to meet the chairman and thank him. ‘I am almost in tears here because I have just learned that today’s chairman paid my fee to come to Portsmouth. ‘It makes me want to come to Portsmouth in the next month or two to meet the chairman and thank him. ‘He is one of the guys I personally would like to thank because he has helped me a lot, not just as a football player but also to be the human being and the man I am today. While McInnes was the unpublicised instigator of Svensson’s switch, then-Blues chairman/owner Terry Venables was the mid-nineties draw for the then 22-year-old, who had just fired IF Elfsborg to the Swedish second division title. Indeed, Svensson thought it was a wind-up when the former England manager, who had just bought the financially-stricken club for a pound, made the call on the advice of scout Ted Buxton. ‘After watching Euro 96 with Terry Venables as manager of England, it was a very big thing when he called my flat in Boras in Sweden,’ said Svensson. ‘I thought someone was joking with me at first but after a while I realised it was him. ‘He explained he had bought Portsmouth for a pound and told me his views of what he wanted to do with the club and it sounded very interesting – as did working with him. ‘I decided to fly over and see the club and the city, it looked good. New-man Svensson made a dramatic start to life at Pompey under boss Terry Fenwick. A week after his debut as a substitute at Sheffield United, the tall, blonde front man scored twice and won his side a penalty in a 3-1 home win over Huddersfield. An instant hit with the Fratton faithful and strike partner Lee Bradbury, Svensson then picked up the only red card of his 12-year playing career in the following game – a 0-0 draw at Reading. He was sent off while leaving the field on a stretcher. He reflected: ‘There was one special guy who really took care of me and is still a good friend of mine, his name is Lee Bradbury. ‘That first home game I assisted Bradders and scored two myself. ‘It was the perfect start for me. ‘In my career, I only ever got sent off once and that was at Reading, away from home in my second full game in England. ‘They had a central defender called Barry Hunter – I had already got a yellow card early on when he took me out badly in a challenge. ‘He got a straight red card and I rushed up a little bit quick and pushed him about a bit. There is one game that stands out more than all others for Svensson in his Blues stay – the famous 3-2 FA Cup fifth-round win at Leeds in February 1999. ‘That was the day of a lifetime,’ said Svensson. ‘Before I moved to England I looked after a couple of disabled people in Sweden. ‘I paid for my brother to come over with one guy, who sits in a wheelchair, and it just happened they came up to the Leeds game. ‘For us, it was a big occasion to go up to Elland Road and play against Premier League Leeds. ‘To win against Leeds, who had a lot of international players, and for me to manage to score a goal and be a part of the other two meant it was a brilliant day. A successful first season in English football saw Svensson earn full international honours for Sweden. But the following campaign brought with it a relegation battle, injuries and a change in management combining to limit the striker’s involvement. He reflected: ‘The success was superb to start off with and I managed to be picked for the Swedish national side, which I thank Portsmouth forever for giving me that opportunity. ‘I was picked twice for Sweden in my Portsmouth career. ‘But just before the summer I managed to break my metatarsal – they call it the Beckham bone now – in my left foot. ‘I was out for a while and then the Terrys left the club (in January 1998 chairman Venables sold up, while Fenwick lost his job with the Blues bottom of the table) as results didn’t go as well. ‘In came new boss Alan Ball and I was told he would be perfect for me because he liked the type of character and footballer I am. ‘In his first speech in the dressing room he told us we should be very proud of representing Portsmouth Football Club because boats left to win the World War from here. Having been largely limited to substitute appearances under Ball, Svensson was handed a surprise and significant return to the starting line-up for the Blues’ final two games of the season. Still fighting relegation, Pompey were chasing back-to-back wins against Huddersfield and Bradford. 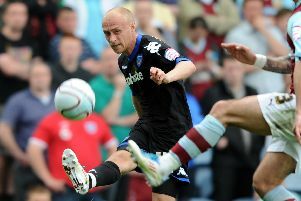 Svensson said: ‘We were on our way to getting relegated from the Championship. ‘I hadn’t played for a while but he (Ball) came to me and told me I was going to play the last two games. ‘I was like “perfect, I love to play football, I have been waiting for my chance”. Sadly, though, for Svensson that was his last game in a Blues shirt, bringing a premature end to a south-coast stay that had promised so much. He said: ‘That was my last game at Portsmouth. ‘I sat down with Alan Ball at end of the season and he told me I had the same chance as everyone else the next season. ‘But from the undertone of his words I knew I wasn’t in his plans. With that, a £100,000 switch to Austrian side Innsbruck was agreed before Svensson swiftly linked up with Venables again at Crystal Palace. A career in English football’s top flight followed with both Charlton and Norwich before a knee injury forced the popular forward to retire at the age of 34 – while back at his first club Elfsborg. Now working in the football tourism industry for Swedish company WatchItLive, Svensson is able to reflect on a ‘tremendous’ career, although remains saddened he was not able to stay at Pompey for longer. He said: ‘Looking back to my 10 years in English football, every year was tremendous. ‘But still to this day I wish I never left Portsmouth so soon. Pompey won 3-1 at Bradford in May 1998 to confirm their First Division survival. There was only me and John Durnin left in the dressing room just before the game, when I went to the toilet. Then as I was going to go out, Durnin stood and had a little drink of a whisky. I said: ‘What the hell are you doing? ‘You have one as well, you’ll play much better,’ he said. I just laughed! In Sweden we are not allowed to drink three to four days before a game. But nowadays, I am giving speeches to kids at football clubs who are looking to become professional players in Sweden. My strongest memories from my time at Fratton Park are the Portsmouth fans. Before I came, I was told Portsmouth and Millwall fans were England’s loudest but that Millwall didn’t behave so well! It was special to meet all of the Pompey people – I still remember John Westwood with his silly hair and tattoos on his face! When I first joined Pompey I received a sponsored car, which this guy arrived at the training ground in – it was a little Rover MG. But I had never sat on the right side driving a car, so when I drove him back to the office I turned the wrong way on the roundabout! This poor guy, he nearly messed his pants. I managed to learn in time, though.